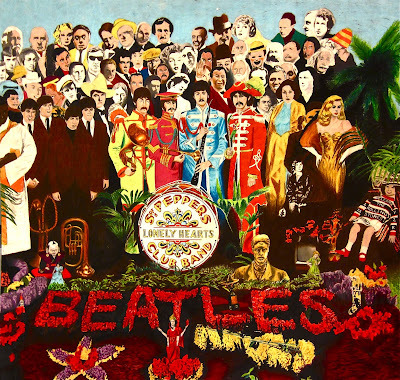 The 50th anniversary reissue of The Beatles’ landmark 1967 album, “Sgt. Pepper’s Lonely Hearts Club Band”, has debuted on the US charts. According to Billboard, the project sold 75,000 units with 71,000 in traditional album sales to enter the Billboard 200 at No. 3, marking the original record’s highest US chart ranking in 50 years. The set was only outsold this past week by projects from Bryson Tiller (“True To Self”) at No 1 and Kendrick Lamar (”Damn”) at No. 2. “Sgt. Pepper’s” originally topped the Billboard charts for 15 weeks in 1967 – the most weeks at No. 1 for any of The Beatles’ 19 US chart-topping albums. Available in a variety of packages and formats, the 2017 reissue features a new stereo mix of the landmark album by Giles Martin and Sam Okell following the original work by the legendary George Martin, while some add bonus tracks and unreleased mixes. The Beatles’ eighth album, “Sgt. Pepper’s” remains one of the best-selling albums in history with more than 32 million copies sold worldwide.